While there are plenty out there with an innate fear of salads—whether for an alleged lack of flavor or people not having a variety of ideas—salads are still one of the easiest ways to get a boost of energy and the plethora of nutrients we need but don’t always get. And nothing makes a salad so tasty as when it has a good, natural, flavorful dressing. The dressing in this case happens to be Manuka honey mustard, offering just the right blend of sweet and spicy to the typical salad in an atypical packaging. 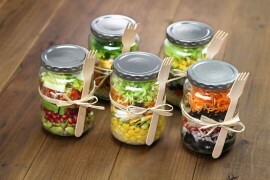 Meaning, for this salad you get optimum protection for the integrity of your lunch with an airtight mason jar. From the peppers, tomatoes, spinach, and cucumbers, you get the garden variety with this salad and a good bite of chicken for those looking for their daily protein boost. The Manuka honey mustard dressing is, as they say, icing on the cake, with enough sweetness to satisfy your sweet tooth for the day without overdoing it. Add all dressing ingredients into a blender and mix or add ingredients into a bowl and use immersion blender to make dressing. Set aside. In both mason jars, build salads by adding the following into each jar in the this order: one ½ tablespoon honey mustard dressing, ½ cup grape tomatoes, 1/3 cucumbers, 2 ounces grilled chicken, ¼ cup roasted peppers, 1 cup baby spinach. Close lid to jars, and store for up to 3 days. When ready to eat, unscrew lid, shake out all the ingredients into a bowl. Stir ingredients through and through and, most importantly, enjoy! Note: You can store extra dressing in a sealed container in the refrigerator for up to one week as per food safety regulations. Nutritional Information: For a single mason jar serving, this spinach salad with honey mustard dressing yields: 240 calories, 10g total fat, 50mg cholesterol, 310mg sodium, 4g dietary fiber, 20g protein, vitamin A: 40%, vitamin C: 45%, iron: 15%. Honey Hunting in the Bangladeshi SundarbansHoneybee Viruses: Can They Transfer Between Species?